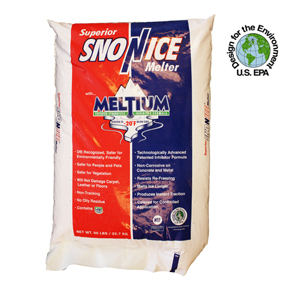 SUPERIOR ICE MELT 50LB BAG - SOLUTEX, INC. Effective to -20°F. Patented synergistic formula with Meltium® and CMA®. Non-corrosive to metal and concrete. Contains vegetation enhancers and protectors. Safe for people, animals and vegetation when used as directed. Unlimited shelf life, does not damage leather or carpets. NSF approved, non-toxic.